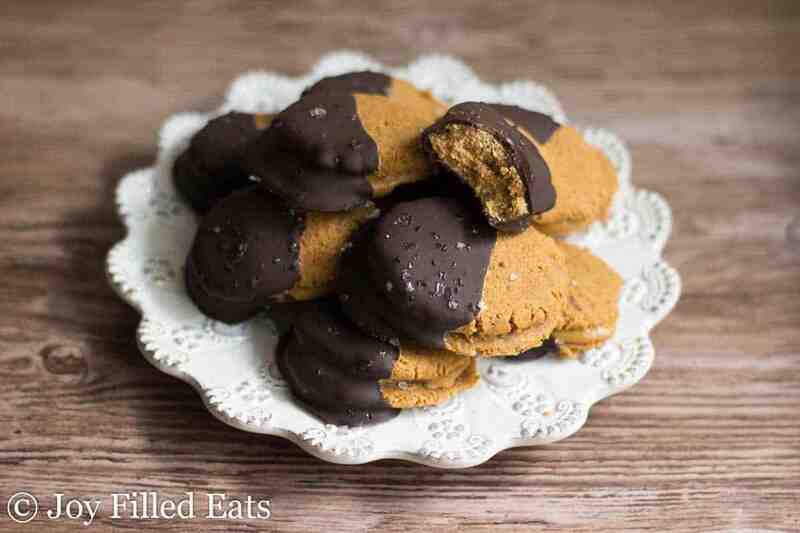 Chocolate + Peanut Butter. A marriage made in heaven. 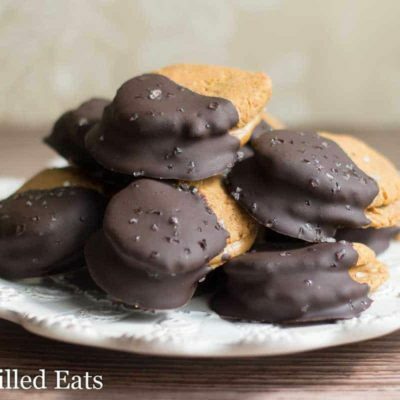 These Chocolate Dipped Peanut Butter Sandwich Cookies are dairy, grain, & sugar free, low carb, and THM S.
As soon as the Thanksgiving leftovers are put away cookie season begins in my house. I bake cookies at least twice a week between Thanksgiving and Christmas so I can put out platters when we celebrate. We normally end up with too many cookies (if there is such a thing) but there are just so many varieties I want to make. There has to be something with chocolate and peanut butter on those cookie trays. Other necessities are something with peppermint, iced sugar cookies, a few nut cookies, and more chocolate cookies. You can see how the cookie count starts to add up. Part of my problem is I will bake a few batches of cookies and then get invited to a cookie exchange. Which I make new cookies for and come home with even more. Luckily, most types of cookies freeze well. I’m happy to share a new dairy free cookie for anyone needing to avoid dairy. It happens to be egg free too. Leaving the egg out of the cookies makes them similar to a shortbread. Combine cookie ingredients in a bowl and mix with a wooden spoon. This dough comes together pretty easily. Divide into 24 pieces. 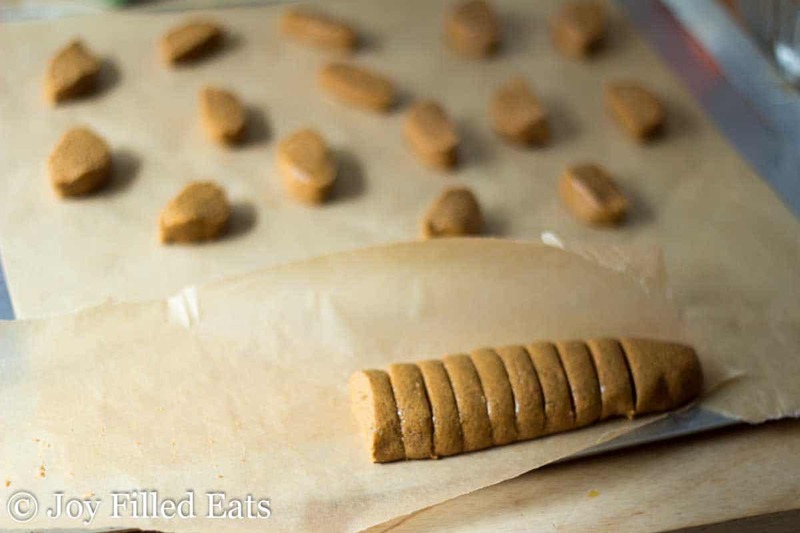 Roll each into a ball and put on a cookie sheet lined with parchment paper. (OR shape the dough into a log and slice 24 pieces but they are more uniform shaped when using the ball method). Sprinkle them with a little extra sweetener. 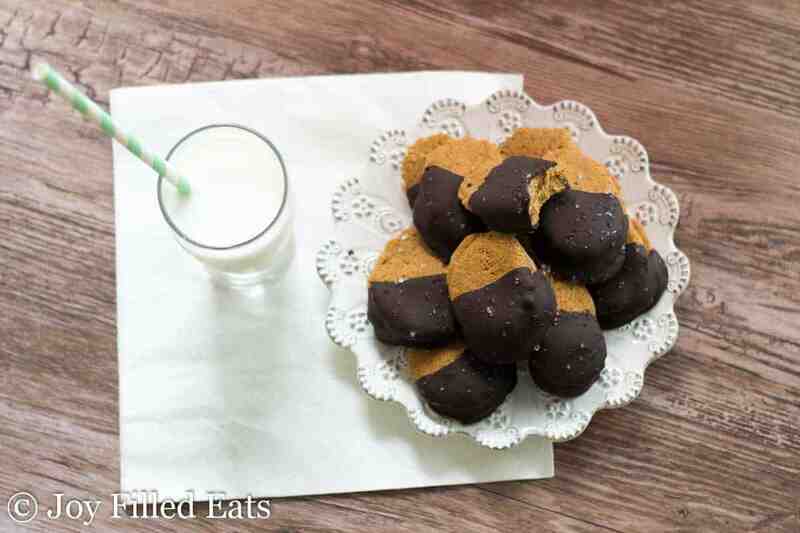 Using the bottom of a measuring cup or drinking glass flatten the cookies to 1/4 inch thick. They might stick to the bottom but just slide the dough off and put it back on the parchment. Bake for 10-12 minutes until the edges are golden. Cool completely. While the cookies are cooling mix the ingredients for the filling. When the cookies are completely cooled flip half upside down and divide the filling between them. Top each with a second cookie. Refrigerate for at least an hour. Melt the chocolate and add the sweetener and peanut butter powder. 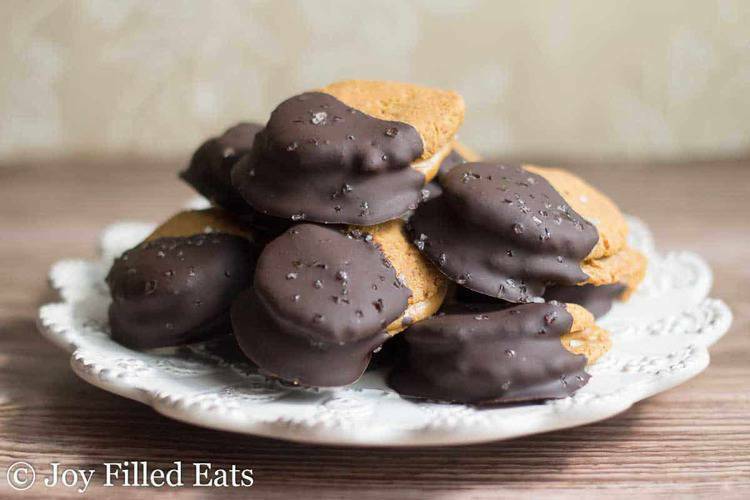 Dip each sandwich cookie in the chocolate. Sprinkle with sea salt if desired. Why use gelatins? Any replacement for it? The gelatin acts as a binder since these don't have eggs. You can use eggs but the cookies will be softer and cakier. 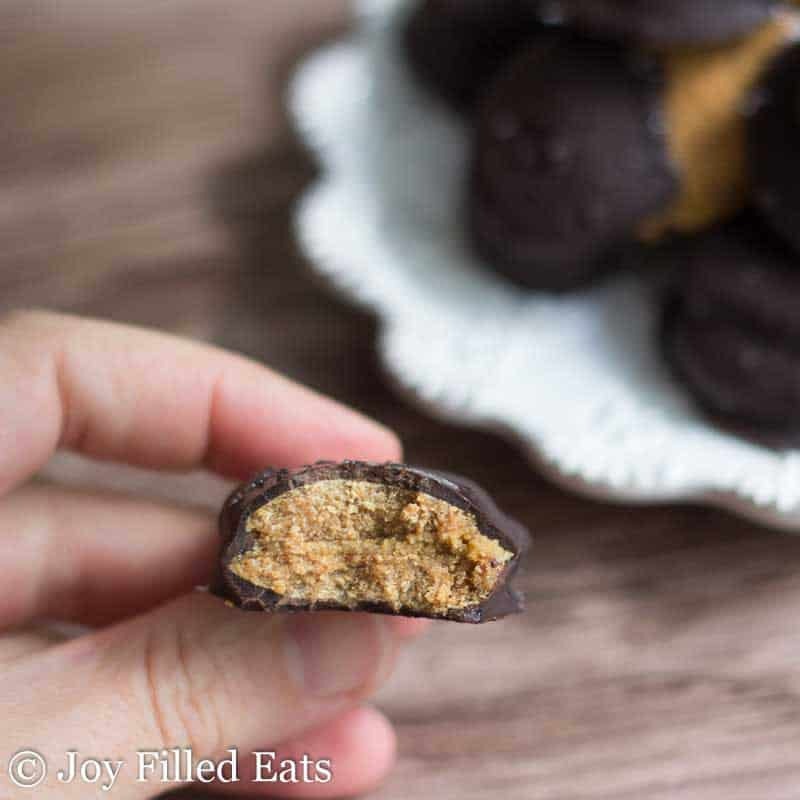 Is the peanut butter powder in this recipe the THM peanut flour? What brand of peanut flour do you use? I've used a few different ones. "Protein Plus" is one. Any that don't have added sugar are fine. 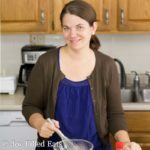 What can be a replacement for coconut products? I can't have them. If you don't need these to be dairy free you can sub in butter.